VEGASWING: For manifold applications in liquids - The piezo drive is the heart of the sensor, activating the tuning fork to vibrate on its resonance frequency. The frequency of the fork reduces with the immersion. The frequency change is evaluated by the integrated electronics and converted into a switching signal. An optimized screwed connection is used to ensure reliability and ruggedness of the piezo drive. With the tuning fork of only 40 mm length, VEGASWINGs work reliably in all liquids independent of the installation position. Pressure, temperature, foam, viscosity and bubbles do not influence the switching accuracy. VEGAVIB: Reliable switching in bulk solids - The vibrating rod of VEGAVIB is activated to vibrate via the piezo drive. If the vibrating rod is immersed, the amplitude will be damped. The electronics detects this damping and converts it into a switching command. Due to the rod design, it is almost impossible for material to build up or get wedged in. The easy cleanability offers the requirements for use in the food processing and pharmaceutical industry. The installation position and granulation size do not influence the reliability. Mounting and setup are very easy, an adjustment with medium is not necessary. Typical applications are overfill and dry run protection systems in products such as plastic granules, styrofoam, milk powder and pellets. VEGAWAVE: Robust and reliable - A tuning fork is used as sensor for the VEGAWAVE series. Control as well as processing correspond to VEGAVIB series. The advantages of this series are ruggedness as well as insensitivity to buildup. 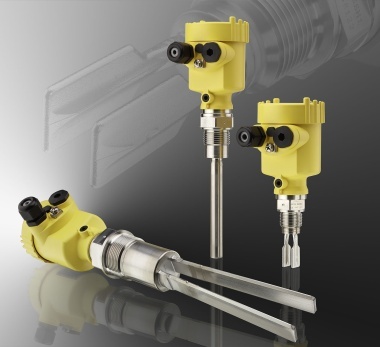 Therefore, it is the ideal sensor for powders and fine-grained products. Mounting and setup are very easy, an adjustment with medium is not necessary. Typical applications are overfill and dry run protection systems in products such as flour, cement, plastic granules, sand fine gravel and styrofoam. These product versions are no longer manufactured - VEGAVIB 31, VEGAVIB 41, VEGAVIB 43, VEGAVIB 51, VEGAVIB 52, VEGAVIB 53, VEGAVIB 55, VEGASWING 71A, VEGASWING 75A, VEGASWING 81A and VEGASWING 83A.